If you want convenience, affordability, and a name you can always depend on for quality service, come to our Holiday Inn Express Bellingham hotel. We are conveniently located and easy to find for all your shopping, entertainment and business needs. Located within walking distance of Bellis Fair Mall, we are a great location at which to stay when coming to Mount Baker Ski Area or San Juan Islands. 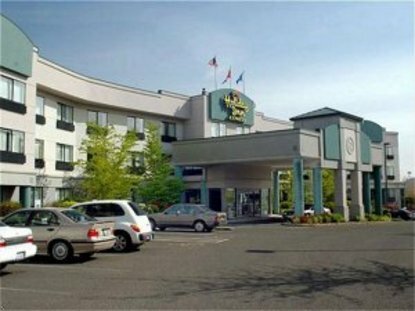 We are also centrally located to three casinos: Silver Reef Casino, Nooksack Casino and Skagit Valley Casino Resort. We offer a heated, indoor pool and Jacuzzi, a complimentary deluxe breakfast bar (now including hot items), free access to a full service health club adjacent to the hotel, complimentary taxi service to and from the local transportation depots, and local calls made at no charge to you. We also offer free high-speed Internet both wired and wireless in all rooms. New business center available in lobby area.Visit Bellingham, WA and Stay Smart at the Holiday Inn Express hotel. This hotel is committed to providing accessible facilities under the American Disabilities Act. If your accessibility needs are not met, please contact the Hotel Manager on Duty. Should you require additional information regarding accessible facilities for guests with disabilities, please call 1-800-Holiday (U.S. and Canada) or contact the hotel directly. For the hearing impaired, TDD service is available at 1-800-238-5544 within the U.S. and Canada.